Thursday, the 30th of September, 2018, Rockville, MD – Insilico Medicine, a Rockville-based company specializing in the application of next-generation artificial intelligence for drug discovery, biomarker development and aging research, is pleased to announce the talk of Polina Mamoshina, a senior research scientist at Insilico Medicine at the 68th British Society for Research on Ageing annual scientific meeting. The BSRA meeting will take place at Oriel College, Oxford on the 6-8th September 2018. The BSRA is committed to funding, supporting and disseminating high-quality research into the biology of ageing. Support is available for active researchers with substantive posts at any UK institution or research institutes which are interested in the biology of ageing and who would normally be eligible for membership of the BSRA. 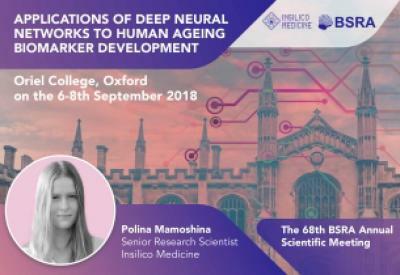 Polina Mamoshina's talk "Applications of deep neural networks to human ageing biomarker development" on the 8th of September, 2018 will be concentrated on using AI to identify useful, cheap and available biomarkers. "I am really fascinated by the opportunity to present some of our recent research at one of the oldest Ageing Research Society annual meeting. At Insilico, we are working on comprehensive and robust biomarkers of ageing developed using deep learning and blood biochemistry, transcriptomics, and even imaging data to be able to track the effectiveness of the various interventions we are developing", said Polina Mamoshina, a senior research scientist at Insilico Medicine. Associate Prof Lynne Cox, who is leading the cellular senescence and ageing research at the University of Oxford and co-organizing the BSRA meeting, noted: "I am delighted that Polina Mamoshina has agreed to speak at the upcoming British Society for Research on ageing annual scientific meeting that I am organising in Oxford from 6-8th September. The conference will address how current ageing research is leading to transformative treatments for age-related disease, and will include updates from exciting new clinical trials on novel anti-ageing drugs. Polina's use of AI to identify clinically useful biomarkers for ageing has huge potential in this context; such biomarkers are needed for diagnosis, prognosis and therapeutic monitoring of new anti-ageing treatments. Her contribution to the meeting will be greatly valued". The work of Polina Mamoshina and colleagues at Insilico Medicine may help improve clinical trial enrollment practices, assess the population specificity of a variety of the biomarkers and pave the way for the development of more complex multi-modal biomarkers of aging and disease.